Leftist Democrats eyeing the White House in 2020 are plotting new ways to confiscate Americans' hard-earned money and give it away. Claiming economic inequality is a national crisis, they want to take money from those they say have too much. 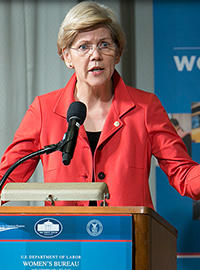 Senator Elizabeth Warren, D-Mass., is pushing a wealth tax. Never mind that it's unprecedented and unconstitutional. Warren says it would target only the richest one-tenth of a percent of the country. Maybe it will — at first. When the federal income tax was imposed a century ago, it initially hit less than 1 percent of the country. Now half the nation pays it. So when you hear the words "wealth" tax, watch your wallet. Warren and like-minded leftists say it's immoral to allow people to accumulate riches when others are needy. But when Warren is asked how she would use the money raised by a wealth tax, she insists the point is "basic fairness." Translation: These Dems' tax schemes are more about punishing the "rich" than helping the poor. You could actually call Warren's scheme a hate tax, because like a hate crime, it targets a specific segment of the population — people these Dems say should not be allowed to be so rich. If these leftist politicians cared about the poor, they'd beef up educational opportunities and job training, and break the teachers' unions corrupt protection of failing public schools. That's wiser than confiscating and redistributing wealth. Knowledge doesn't have to be taken from one person to be given to another. A child in poverty whose parent has a high school degree or better has a 70 percent shot at rising out of poverty, according to Brookings Institution data. If a parent is a college grad, the chances increase to 84 percent. Education beats handouts when it comes to escaping poverty. Tell that to presidential aspirant Sen. Cory Booker, D-N.J., who wants Uncle Sam to give nest eggs to poor kids. Booker would open a $1,000 savings account for every child born in the United States, courtesy of taxpayers. After that, kids in the poorest families would get up to $2,000 added each year. Other kids would get much less or zip. What a slap in the face to parents who save to give their own children a nest egg. Who wants to pay taxes to bankroll someone else's kid? Booker brags his plan would help equalize the races. The average black child would end up with almost $30,000 at age 18, the average white kid only half that. Booker's plan also defies common sense. It doesn't even limit the use of the money to education. Handing over tens of thousands of dollars to a teenager to buy a home or take a stab at investing is nuts. Better to supply a kid that age with a first job. Twenty years ago, over half of teens ages 16 to 19 worked. Now only one-third do, according to Labor Secretary Alexander Acosta. Meanwhile, as more Dems enter the presidential race, the competition to stick it to the rich and spread the wealth heats up. Sen. Kamala Harris, D-Calif., is pushing monthly cash payments from Uncle Sam to the middle class. This is blatant vote buying. Think you're going to be on the receiving end of these Robin Hood schemes? Think again. If Warren's wealth tax hits only the uber-rich, it would only rake in $2.75 trillion over a decade, according to the University of California economists who devised her plan. Yet Warren's backing a list of social programs — including government-run health care for all, free college, student loan forgiveness and a guaranteed jobs programs — with a tab of $42.5 trillion, 15 times what taxing the uber-rich would produce. The Dems' share-the-wealth schemes will end up fleecing millions more people, not just who Congresswoman Alexandria Ocasio-Cortez, D-N.Y., misleadingly calls the "tippy-tops." A wealth tax is a lot more intrusive than submitting a W-2. Warren predicts more IRS agents will be needed. They'll have to value your home, your cars, furniture and jewelry. Fair warning to hardworking, successful people. You're in the Dems' confiscation crosshairs. » Greatest Economy Ever? Signs Increasingly Suggest "Yes"